It’s an unpleasant fact of life, but many of us have racked up a significant amount of debt. We’ve got student loans, mortgages, car payments, credit card bills, and more places we owe money. This forms a piece of our marriages as well. We all know finances play a big part in ending a union, but how do courts treat debt in divorce? When you marry, you start amassing debt for two, even more if you have kids. The division of property forms a significant part of the process of dissolving a marriage. So, too, is splitting up remaining financial obligations. In short, debt and divorce go hand in hand. Marriage means you share everything, and that includes money owed. Even after things end, financial missteps can have a significant impact. It’s important to know what to expect moving forward. 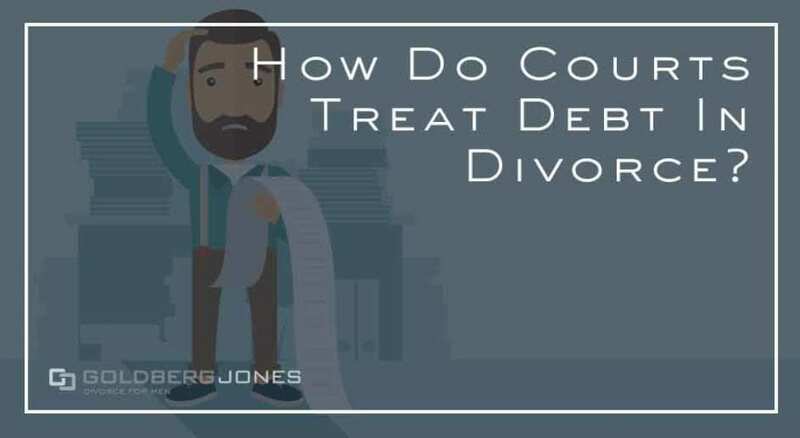 In divorce, the court treats shared debt much the same way as it treats assets and other resources. Washington is a community property state, which means that the government views all assets, as well as debts, accrued during the marriage as equally belonging to both spouses. While that may sound like a logical way to approach the situation, it can also include debts you weren’t aware of. If you have separate credit cards, for instance, and your ex purchases a big-ticket item without your knowledge, you may find yourself obliged to pay back that amount. It doesn’t necessarily matter whose name shows up on the bill, you both share responsibility. Community property doesn’t mean courts split everything down the middle in a divorce. The court’s primary goal is to ensure both parties come out of the marriage on relatively even footing. Beyond that, they want each spouse to maintain a lifestyle similar to what they had while married. Am I on the Hook For My Ex’s Debt? When you marry and build a life together, bills can pile up. When it comes to debt and divorce, that’s often your issue to deal with. Pre-existing liabilities, however, are something else entirely. What that means is that you’re not on the hook for your ex’s financial obligations. Any lingering student loans amassed before your marriage aren’t your problem. Neither are those massive credit card bills your spouse ran up before you got together. Once you finalize your divorce, your finances obviously become two distinct things. You have separate bank accounts, credit cards, and the whole works. But debts that build up after a separation, but before signing the final papers, fall into a bit of a gray area. In these cases, the court tries to determine if they’re necessities or not. A judge might divide common expenses, like an electric bill or utilities payment for the family home. But if your soon-to-be ex puts a trip to Hawaii on the joint credit card, they might view that in a different light. One thing to carefully consider when it comes to debt and divorce is any outstanding loans you have. While ending a marriage affects nearly every aspect of your life, it doesn’t alter any financial agreements you made with outside parties. If your name appears on a home or car loan, divorce doesn’t change that. When you and your spouse establish a line of credit, those terms remain in place. Creditors are only obliged to honor the conditions as they appear on the initial agreements, and divorce doesn’t automatically alter those. So even if your ex gets the house in divorce, if your name still appears on the paperwork, it can impact you. If your former spouse misses a mortgage payment, it negatively reflects on you. If it gets bad enough, creditors may come after you for payment or take legal action against you. The most common way to protect yourself in these situations is to refinance loans. Divorce agreements often include terms that your ex must accomplish this task by a certain date. This offers one way to shield yourself from future financial misdeeds. Still, you want to make sure it actually happens. Even if refinancing was supposed to happen, if it doesn’t, it can still come back to bite you. As with most legal matters, dealing with debt and divorce can become incredibly complicated. In shorter marriages or cases without much in the way of shared property, it can go relatively smoothly. But the more you have to deal with, the more problems can arise. It’s important to be aware of your finances in divorce, and the same goes for debts. Make sure you keep tabs on how much you owe, and where, whether it’s in your name or your spouse’s.